Hello! How has everyone's week been? Kylie is described as “A zesty shade of lipstick pink that takes it up a notch with its shimmery finish”. 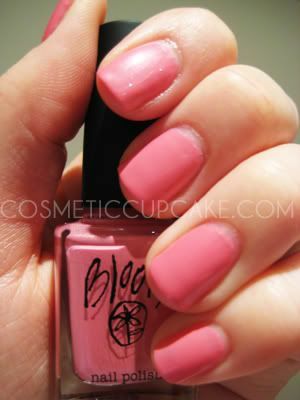 The colour is a nice bright shade of pink however I don’t think it really goes with my skin tone. Above is 2 coats topped with Seche Vite. The 1st coat was very streaky and had bald spots galore but a thick 2nd coat fixed it. I then decided to do some konading so I went with the French tip bows from plate m56 with Konad special polish in white and silver diamantes. Thanks for looking! If you enjoy reading my blog please follow me! @xphoebelinax: I think it depends on the shade of pink and your skintone. I'd say buy loads of pinks and see which one suits you the best! That is soooo cuteeeeee! WOW I LOVEEE IT! :D Great color and great design. @Alice: Hehe thanks Alice! 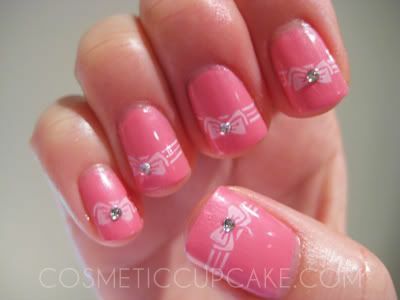 I love pinks and I love bows.. why not combine the 2?!? It'd be so much fun if you came to Syd! @puranki: Konad have the cutest designs. I'm in love with all their ribbon designs!